A friend sent this to me a while ago, so I thought I'd get off my duff and post it. It was taken in Silicon Valley last year, and it shows just how silly some people can be. 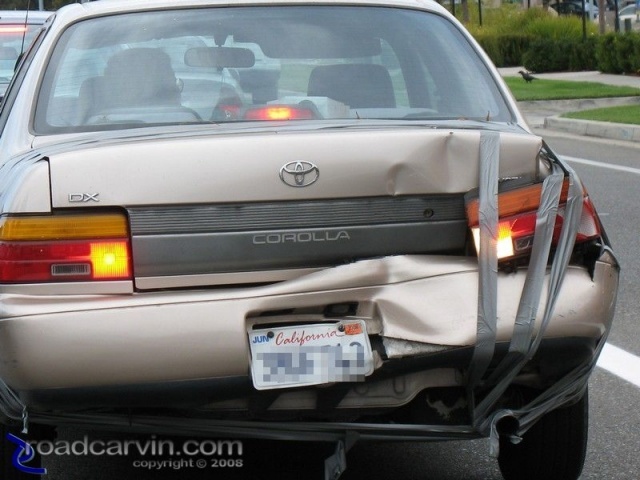 Here we have a car that has taken a significant impact to the rear quarter, enough to tweak the entire car (this is a unibody car, after all) and someone felt it would be reasonable to 1) hold it all together with duct tape, and 2) drive the car in Bay Area traffic. Stay alert, people. This kind of driver is capable of all sorts of carnage. I'm riding southbound on highway 880 in Milpitas and I see a CHP cruiser driving on the onramp to the freeway. I naturally slow down and keep an eye in my mirrors for the officer. Just before the split for highway 237 an econobox (Corolla?) passes me on the right and cuts in front of me by a few feet crossing 3 lanes. I tapped the brakes and shook my head. The next thing I know the CHP cruiser passes me and pulls in behind the moron driver and lights him up. I was smiling for the next 20 minutes. Thank you Mr. CHP for making my day in a good way.